PCRT 3D is a complete radiotherapytridimensional planning system intended for photon and electron treatments managed by an intuitive, easy, flexible and versatile application, which complies with a strict Quality Assurance Program based on the AAPM and IAEA recommendations. The system allows full imaging device networking through DICOM (CT, MR, PET, Ultrasound, PACS, etc…), Treatment Units (LINAC, portal image devices, and block mold cutting system), R&V Systems and other TPSs. PCRT3D offers a number of application fields, including: Virtual Simulation, External Radiation Treatment with LINACs or Cobalt Units, IMRT, Brachytherapy and Permanent Seeds Implant. The graphic interface -based on Windows- is easy to use and intuitive, allowing for convenient swift and efficient performance. PCRT3D includes a software security system based on users and user rights. Any modification made in a specific planning is registered in a database. PCRT3D is a continuously evolving system, developed by a team of highly experienced professionals -including engineers, physicists and Medical physicists who are, also, part in providing our clients with technical assistance and support. We offer different payment options including Pay as You PlanSystem: Customer purchases individual licenses for patient plans. Contouring is user-friendly and easy, allowing an intuitive use of the software. All operations are displayed in real-time, in axial, sagittal, coronal, DRR and 3D imaging. The automatic multimodal registration algorithm performs intermodal fusion using CT, PET, MR images, with no restrictions with regards to the positioning of the patient, making the identification of anatomical structures unnecessary. PCRT3D provides a wide range of tools to define organs in the most complex 3D operations, allowing the easy creation of new volumes based on previously generated ones. Real-Time Virtual Simulation with all possible configurations and utilities available: Wedges, Blocks, Bolus, Compensators and Multileaf Collimators. All of the beam’s geometrical parameters can be configured by simply using the mouse or the keyboard. The import and export is based on the standard DICOM, which is compatible with all manufacturers. The definition for the radiation beams is directly edited on the DRR as well as on axial, sagittal and coronal images, whether manually or automatically. Photons: Collapsed Cone superposition convolution and 3D modified Clarkson integration. Additionally, redundant MU’s/time calculation is automatically performed by the system. Templates can be created from user plans to ease theplanning process.Simultaneous displays of different plan options to select the treatment of choice.The printed reports can be configured using an editor, and the treatment planning sheets can be automatically generated. PCRT3D offers different options for IMRT planning through the definition on the DVH. 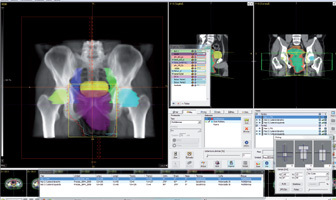 Inverse planning with Step & Shoot segmentation, sliding windows or physical compensators. Electronic Compensator to achieve a homogenous dose distribution. All isotopes supported, TG43 formalism compliant.CT, US, MR images or orthogonal radiographies can be used for 3D planning. Plan evaluation using patient contouring to obtain DVH and summation with external beam plan.Post-implant verification by CT images for permanent implants. Densirad is a system intended to analyze dosimetric films digitalized with a transmission scanner. Specific tools to perform quality control of Linear Accelerator following TG142 and quality control of XRay equipment. Allowing to comparethe calculated dose map from the TPS and the measured delivered dose by films or 2D arrays using Distance to Agreement (DTA) and Gamma Analysis. Our services are conducted by specialized medical physicists and TPS developers. Start up of the TPS: Onsite training, beam modelling and review of the users’first plans. Remote monitoring connection to customers’ workstationsin real time,to solve doubts and incidences during the execution of the application.